This last car is still in production. I apologize for the extended and unexpected delay. Although not sold out, the final cars will become available here after the main batch of cars are shipped and we know how many are left. This is the seventeenth and final release in the series creating this amazing train of patriotic cars. Release #17 is the tool car, road number 76. This car is very special and just maybe, I saved the best for last. This ‘Tool Car’ was support for the steam engine 4449 and usually was the first car behind that engine. 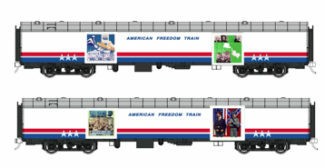 The American Freedom Train car 76 will be the first production of a new process. Micro-Trains has been commissioned to produce this using their heavyweight car, with photo-etched sides, to create this unusual piece. I cannot wait for you to see this release because the detail is amazing! I have a plan that will be a limited solution in case you have missed a prior release such as release #15. If that is the case, please email me what is on your ‘list of needs’ and I will see if it can be done or not. Please DO NOT wait long to order this final car. It is one for the record books. Thank you again for coming along on this fun journey!